Is the Milky Way getting bigger? The galaxy we inhabit, the Milky Way, may be getting even bigger, according to Cristina Martínez-Lombilla, a PhD candidate at the Instituto de Astrofísica de Canarias in Tenerife, Spain, and her collaborators. She will present the work of her team in a talk on Tuesday 3 April at the European Week of Astronomy and Space Science in Liverpool. 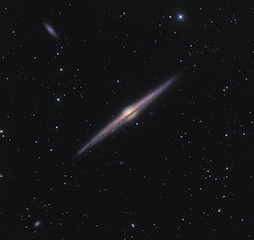 NGC 4565, a spiral galaxy estimated to be 30-50 million light years away. Credit: Ken Crawford. Click for a full size imageThe Solar System is located in one of the arms in the disc of a barred spiral galaxy we call the Milky Way, with a diameter of about 100,000 light years. Our home galaxy consists of several hundred billion stars, with huge amounts of gas and dust, all intermingled and interacting through the force of gravity. The nature of this interaction determines the shape of a galaxy, which may be spiral, elliptical or irregular. As a barred spiral, the Milky Way consists of a disc in which stars, dust, and gas lie mostly in a flat plane, with arms stretching out from a central bar. In the disc of the Milky Way there are stars of many different ages. Massive, hot, blue stars are very luminous and have a relatively short lifespan of millions of years, whereas lower mass stars eventually end up redder and much fainter and may live for hundreds of billions of years. The younger short-lived stars are found in the disc of the galaxy, where new stars continue to form, whereas older stars dominate in the bulge around the galactic centre and in the halo that surrounds the disc. Some star-forming regions are found at the outer edge of the disc, and models of galaxy formation predict that the new stars will slowly increase the size of the galaxy they reside in. One problem in establishing the shape of the Milky Way is that we live inside it, so astronomers look at similar galaxies elsewhere as analogues for our own. Martínez-Lombilla and her colleagues set out to establish whether other spiral galaxies similar to the Milky Way really are getting bigger, and if so what this means for our own galaxy. She and her team used the ground-based SDSS telescope for optical data, and the two space telescopes GALEX and Spitzer for near-UV and near-infrared data respectively, to look in detail at the colours and the motions of the stars at the end of the disc found in the other galaxies. The researchers measured the light in these regions, predominantly originating from young blue stars, and measured their vertical movement (up and down from the disc) of the stars to work out how long it will take them to move away from their birthplaces, and how their host galaxies were growing in size. Based on this, they calculate that galaxies like the Milky Way are growing at around 500 metres per second, fast enough to cover the distance from Liverpool to London in about twelve minutes. This slow growth may be moot in the distant future. The Milky Way is predicted to collide with the neighbouring Andromeda Galaxy in about 4 billion years, and the shape of both will then change radically as they merge. The team carrying out the new work consists of Cristina Martínez-Lombilla, Professor Ignacio Trujillo Cabrera and Professor Johan H. Knapen, all based at the Instituto de Astrofísica de Canarias in Tenerife, Spain. The European Week of Astronomy and Space Science (EWASS 2018) will take place at the Arena and Conference Centre (ACC) in Liverpool from 3 - 6 April 2018. Bringing together around 1500 astronomers and space scientists, the conference is the largest professional astronomy and space science event in the UK for a decade and will see leading researchers from around the world presenting their latest work. EWASS 2018 is a joint meeting of the European Astronomical Society and the Royal Astronomical Society. It incorporates the RAS National Astronomy Meeting (NAM), and includes the annual meeting of the UK Solar Physics (UKSP) group. The conference is principally sponsored by the Royal Astronomical Society (RAS), the Science and Technology Facilities Council (STFC) and Liverpool John Moores University (LJMU). Liverpool John Moores University (LJMU) is one of the largest, most dynamic and forward-thinking universities in the UK, with a vibrant community of 25,000 students from over 100 countries world-wide, 2,500 staff and 250 degree courses. LJMU celebrated its 25th anniversary of becoming a university in 2017 and has launched a new five-year vision built around four key ‘pillars’ to deliver excellence in education; impactful research and scholarship; enhanced civic and global engagement; and an outstanding student experience. The Royal Astronomical Society (RAS), founded in 1820, encourages and promotes the study of astronomy, solar-system science, geophysics and closely related branches of science. The RAS organizes scientific meetings, publishes international research and review journals, recognizes outstanding achievements by the award of medals and prizes, maintains an extensive library, supports education through grants and outreach activities and represents UK astronomy nationally and internationally. Its more than 4000 members (Fellows), a third based overseas, include scientific researchers in universities, observatories and laboratories as well as historians of astronomy and others. The RAS accepts papers for its journals based on the principle of peer review, in which fellow experts on the editorial boards accept the paper as worth considering. The Society issues press releases based on a similar principle, but the organisations and scientists concerned have overall responsibility for their content. The European Astronomical Society (EAS) promotes and advances astronomy in Europe. As an independent body, the EAS is able to act on matters that need to be handled at a European level on behalf of the European astronomical community. In its endeavours the EAS collaborates with affiliated national astronomical societies and also with pan-European research organisations and networks. Founded in 1990, the EAS is a society of individual members. All astronomers may join the society, irrespective of their field of research, or their country of work or origin. In addition, corporations, publishers and non-profit organisations can become organizational members of the EAS. The EAS, together with one of its affiliated societies, organises the annual European Week of Astronomy & Space Science (formerly known as JENAM) to enhance its links with national communities, to broaden connections between individual members and to promote European networks. The Science and Technology Facilities Council (STFC) is keeping the UK at the forefront of international science and has a broad science portfolio and works with the academic and industrial communities to share its expertise in materials science, space and ground-based astronomy technologies, laser science, microelectronics, wafer scale manufacturing, particle and nuclear physics, alternative energy production, radio communications and radar. STFC's Astronomy and Space Science programme provides support for a wide range of facilities, research groups and individuals in order to investigate some of the highest priority questions in astrophysics, cosmology and solar system science. STFC's astronomy and space science programme is delivered through grant funding for research activities, and also through support of technical activities at STFC's UK Astronomy Technology Centre and RAL Space at the Rutherford Appleton Laboratory. STFC also supports UK astronomy through the international European Southern Observatory.